PCH, Aussie Edition: Humber Hawk or Morris Major? 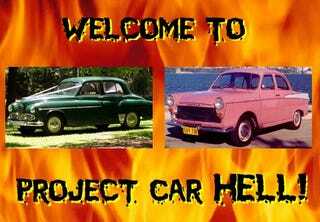 It's been a while since we last took a look at the Hell Projects available outside of the United States, but Project Car Hell is something we all have in common. Yes, whether you're beating your skull against a ZAZ in Mongolia or a Simca in Monrovia, you know the agony of having this seriously cool car that you can't possibly get working! And now that we've indulged our love for gratuitous italicization, let's take a look at some wonderful cars down Australia way, suggested by Aussie tipster and hellmobile connoisseur BillStewartX. We're working on cooking up some sort of prize for PCH tipsters whose stuff we actually use, so keep 'em coming! Project Car Hell, UK Edition: Reliant Scimitar or Humber Sceptre? When you're looking for a good, solid project car, what's the first place that comes to mind? Tin Can Bay, Queensland, of course! Yes, Tin Can Bay is where you'll find this 1956 Humber Hawk sedan. According to Bill, parts are just about impossible to find, and the performance- in his words: "2 liters pulling 16 tons of iron down the road.... veeeerrrry slowly....." According to the seller, it's in pretty good mechanical shape, and it looks like the body and interior aren't so bad, but you have to figure that even the slightest problem will involve endless phone calls to former outposts of the British Empire ("Hello? Nairobi?") in order to find parts that never existed in Australia and were long since forgotten back in the Humber's homeland. All your sufferings will all be worth it, however, as you cruise (slowly) down the boulevard in your fully-restored Hawk. Hmmm... would the Humber fanatics string you up if you dropped a turbocharged GMC 292 in it? Having a customized 50s machine with a pink paint job makes you feel cool, of course, and it's hard to get any cooler than a '62 Morris Major Elite, available now with an asking price of just 1500 Australian dollars. If ever there was a car that deserved a great big 6-71-enhanced V8 sticking through the hood, this is it! Oh, sure, you'll have a helluva time getting all the trim pieces missing from the side of the car you can't see in the photo, and it's probably got rust galore. But since you'll need to fabricate a custom tube frame for the new/improved drivetrain anyway, you'll have plenty of time to sort out the body and interior woes. We think the shade of pink needs to be louder, too, to go along with the Cherry Bombs.